The Mariano's deserved unanimous Hall of Fame election might provoke a new baseball debate headache. have known he might provoke . 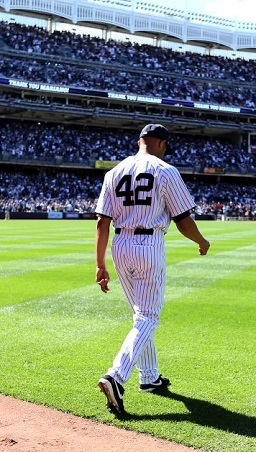 . .
There’s another reason to heave a big sigh of relief now that Mariano Rivera’s unanimous election to the Hall of Fame is consummated and confirmed. At long enough last the ridiculous tradition of no unanimous Hall elections has been fractured. But does it also mean a new headache for Hall of Fame voting through no fault of his or anyone’s own? Baseball inspires debates as often as it inspires jaws to drop, but few things about the game inspire as many debates which do drop jaws as often as Hall of Fame debates. They drop jaws, run temperatures up scales, and produce almost as much foolishness as political debates with about a sixteenth of the damage. Aside from laughing your fool head off when you ponder that worse things can be said of you than your not being as good as Ruth or Mays, Miller has a point though he didn’t come right out and say it. You don’t have to be Babe Ruth or Willie Mays to be a Hall of Famer. You don’t have to be their kind of great. You just have to be great at all, under the terms of the game you played when you played it. In my lifetime I can think of a number of Hall of Famers whom you might have thought to be unanimous choices but weren’t. But if they were that obviously Hall of Fame great (there are several writers-vote Hall of Famers whose cases kind of snuck up on you when you looked at their careers deeper, including newly-elected Mike Mussina) what was to keep them from being unanimous choices? Not just because they were going to go in anyway but because the voting writers saw them as so obviously Hall of Fame-great. But it came down too long to, The Hall of Fame’s inaugural five (Ruth, Ty Cobb, Walter Johnson, Christy Mathewson, and Honus Wagner) weren’t unanimous; Joe DiMaggio wasn’t unanimous; Stan Musial, Sandy Koufax, and Bob Gibson weren’t unanimous; Willie Mays, Hank Aaron, Frank Robinson, and Tom Seaver weren’t unanimous; so, why should anyone else get to be unanimous? This has always been obnoxious — a petty veto power a tiny minority of the voters have chosen to wield — but it also cuts directly against one of baseball’s main themes: It’s a game of failure. You fail seven out of 10 times and make the Hall of Fame, they say. But here the Hall’s gatekeepers had decided that in fact failure was prohibitive. No matter how good you got, you had to be perfect or else not worthy of some recognition these vetoers denied you. I couldn’t resist rejoining that comparing Mariano Rivera to Craig Kimbrel was tantamount to comparing a millionaire who got that way from his own creation to one who got that way from organised crime. If all you looked at were the saves, you’d have Rivera as the all-time leader and maybe—big maybe—nothing much more. It’s when you remembered how he got those saves that you saw a so-obvious-Stevie-Wonder-could-see-it Hall of Famer. But in case you missed when I first recorded it, batters swinging with men on base at all hit .210 against Rivera lifetime (and that’s three points less than they hit against him with the bases empty), and when they hit with men in scoring position against him they hit .214 lifetime. There are other bona fide Hall of Fame pitchers who weren’t that deadly against the hitters who faced them. There was never any argument over whether Rivera would make the Hall of Fame at all in his first appearance on the writers’ ballot. So why on earth should there have been any over whether he’d become the first to get there unanimously? Because, well, you know all those other, previous, too-obviously-first-ballot Hall of Famers who didn’t get there unanimously, too. And Rivera just blew those arguments away with the same aplomb with which he blew hitters away. If anything, the one possible land mine in Rivera’s unanimous election might be that we revive the perfection argument all over again—future relief pitchers who prove to be Hall of Fame worthy in their line of work (with or without a reconstitution of a relief save) may be compared to him and dismissed because, well, they won’t prove to have been as near-perfect as he was. This is the last thing we should want or Rivera himself might seek. But another ESPN writer, Buster Olney, says something else new might come about thanks to Rivera’s unanimous election: “Now that this is finally possible, moving forward, the new 100% standard will help to create an inner circle of HOFers—the players who are unanimous selections from 2019 forward.” There’s something good and bad about that, and it’s not even The Mariano’s fault. Bad because there may come too many instances of people judging Hall of Famers not by the actual way they played the game but by whether or not they got into the Hall of Fame unanimously. Mike Trout and Max Scherzer becoming unanimous Hall of Famers (yes, it could happen, depending on the rest of their careers) shouldn’t be allowed to diminish Willie Mays or Randy Johnson for it. It’s one thing to revise history based on real evidence and real conditional differences (the latter, of course, were hardly his direct doing) and conclude Babe Ruth was the greatest player of his time and of the pre-integration/pre-night ball era but not of all time. It’s something else again to decide he’s less a Hall of Famer than someone else simply because he wasn’t the unanimous Hall of Fame selection he should have been. Who’d have thought we’d have a chance to get to the place where we go from diminishing Hall of Famers because their forebears weren’t unanimous selections to diminishing them because their forebears were unanimous selections? Well, I did say half the fun of baseball is in the debates it inspires. But as Yosemite Sam once said, maybe that’ll learn me to keep my big mouth shut. * In the interest of fair disclosure, I should point out that the Internet Baseball Writers Association of America, of which I am a life member, does ceremonial Hall of Fame votes every year—and, alas, the IBWAA didn’t vote for Mariano Rivera unanimously. The lone holdout was a member who writes about the Mets for Forbes and says, erroneously, that The Mariano is the most overrated player of all time. Page created in 0.748 seconds with 21 queries.